Lin is currently exploring moods and atmosphere through cloudscapes in oil painting. She has studied Turner and Constable and has given her skies a contemporary twist, often using her fingers or a palette knife to make heavy impasto marks in a square format. The small strip of landscape is usually local, even though it may look understated and generic. Her work ranges in size from 20cm x 20cm up to 120cm in length. Sometimes she goes back to her old favourite still life themes in vase and bottle paintings in oils, depicting glass and reflections. These explore the object in a quiet, shallow space, often giving the vase a museum-like sense of presence. 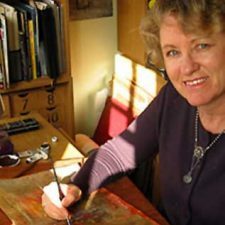 Her background is deeply rooted in fine arts, and after many years in calligraphy and graphic design, she has recently returned to her first love of oil painting. Her graphic design / calligraphic teaching took her to all parts pf the UK, Belgium and South Africa. She is one of the better known British Calligraphers. Lin is a compulsive recorder of musings and thoughts about her medium and materials, and these are expressed in her blog. The Limetrees Newsletter gives photographic updates on workshops and current art events. Subscribe on the contact page. She has won many prizes and awards for her calligraphy. Pythagoras QED is in the permanent collection of the Fitzwilliam Museum, Cambridge. Lin has always produced art for as long as she can remember. She trained at Wits University in fine arts and as an Art teacher through UNISA. Dave and Lin moved to the United Kingdom in 1998 from Cape Town, South Africa. They live in Oxfordshire with their Westie, Islay, and a grey cat called Misty.